Isabelle will be a Visiting Scholar at the Havens Center for Social Justice of the U-Wisconsin-Madison. She will take part in Erik Olin-Wright's Real Utopias Graduate Seminar. 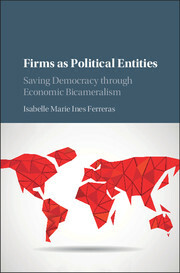 Isabelle Ferreras: The Situation Today: Firms are Political Entities from Patrick Barrett on Vimeo.